Each donor's gift of generosity makes it possible to give our students the values, skills, knowledge and opportunities required to compete in an ever changing world and an increasingly competitive work environment. It also enables Florida Tech to attract top notch faculty and staff, conduct research, and provide outreach services. The impacts of these gifts are experienced when someone reads the Florida Tech Today magazine, visits the campus, or reads the latest news on our website. Florida Tech will continue to thrive because of many donors commitment of involvement and support. For your interest, we present these examples of our donor community. Each represents the passion and commitment of thousands more who renew their pride of association with Florida Tech every year. Would you consider making a difference? . Known to lead by example, Phillip W. Farmer demonstrated his commitment to Florida Tech through a $1.5 million endowment to create the Farmer Scholars Program. The retired chairmen, president and chief executive officer of Harris Corporation said the gift was his way of recognizing the importance of the scholarships for deserving students. The scholarship is modeled after the Angier B. Duke scholarships at Duke University. As one of the two finalists in eastern North Carolina for the Angier B. Duke scholarship in 1960, Farmer did not win the big prize, but did receive a full tuition and fees consolation scholarship to attend Duke University, which was the boost he needed to begin his storied career. “College would have been impossible without that help. Our family simply did not have the means,” he said. Farmer Scholars receive full tuition and university fees, a meal plan and residence at Harris Village’s Farmer Hall, as well as a summer study abroad program at Oxford University between the junior and senior years. The program is open to Florida resident students who graduate in the top five percent of their high school class. Nathan M. Bisk, one of the nation’s leaders in continuing education and online learning, presented the university with a $5 million dollar gift. The gift is designed to enhance business offerings and strengthen online education. In appreciation, Florida Tech President Anthony J. Catanese announced that the university would rename it college of Business the Nathan M. Bisk College of Business. The $5 million gift will be used to support the College of Business in three primary ways: 1) establishment of an endowed Chair of Business to be named the Max, Edith and Robert Bisk Distinguished Chair of Business; 2) marketing and branding of the college; and 3) growth of the online business programs. While most often associated during its 50-year history with excellence in engineering and science programs, Florida Tech is gaining new attention for its business curriculum. Since the online undergraduate degree and MBA degree programs launched in early 2008, enrollment in these business programs has grown to approximately 4,000 students. 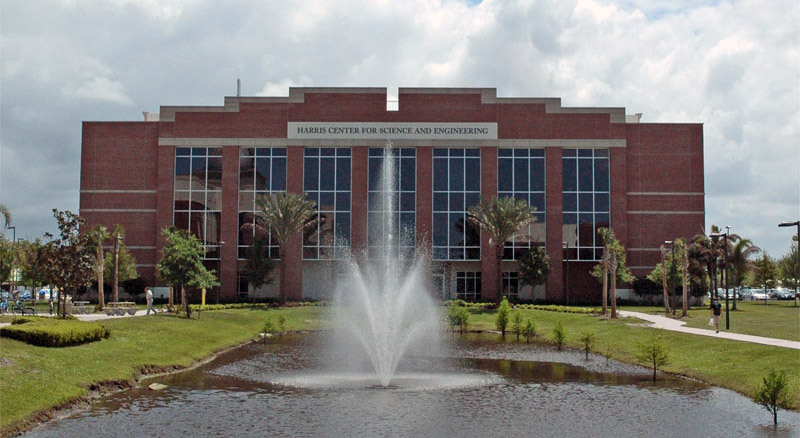 In the fall of 2009, the Harris Center for Science and Engineering opened its doors, heralding a new chapter for both Florida Tech and Harris Corporation. Inside the contemporary three-story, 29,000-square-foot building on the Florida Tech’s south campus, scientists, engineers and students at the Harris Institute for Assured Information will develop solutions to provide individual and organizational security. The project was made possible thanks to a $5 million gift from the Harris Corporation Charitable Fund, a donor-advised fund held by the Community Foundation of Brevard. In addition to underwriting construction costs for the center, the donation will also finance a Harris Faculty Chair in Assured Information and provide support to students through scholarships and fellowships. Another $2 million in corporate dollars is earmarked to support research. President and chief executive officer of the Community Foundation of Brevard, Gary R. Lang, praised Harris Corporation for recommending the gift, which came from an endowment established with the foundation more than eight years ago. Calling the CFB a “savings account for other charities,” Lang explained that the principal of the original gift from Harris Corporation to CFB remains intact, with the gift coming from investment proceeds. Donors come from every corner of the Florida Tech family – alumni, faculty, students, parents and friends – and, collectively, they make it possible to attract and retain a distinguished faculty and recruit students who are the emerging leaders of our world. If you decide to support Florida Tech, please know that we respect CASE standards and The Donor's Bill of Rights.